Alexandria has a thriving gourmet scene for those who love to cook, and those who want to learn. The freshest ingredients can be found at the city&apos;s farmers markets, made even better with spices from the Spice & Tea Exchange. Del Ray’s Cheesetique is nationally renowned for its vast selection of cheese and while you’re in the neighborhood, head to Planet Wine because nothing goes better with brie than a glass of Chardonnay. Decadent cupcakes form towers in the windows at Lavender Moon while the Dairy Godmother serves up real Wisconsin-style frozen custard. 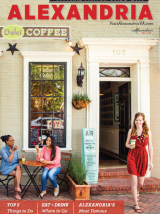 Speaking of authentic, for authentic Italian gelato and creative flavors head to Old Town Dolci Gelati Café.